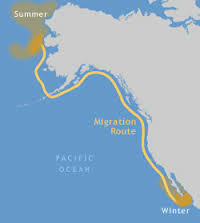 A friend invited me to go whale-watching outside Monterey Bay during the migration of the gray whales along the “Whale Highway” which stretches along the California coast from Alaska to Cabo San Lucas. Shortly after leaving the shelter of the bay, we spotted plumes of vapor not far off – at least a dozen whales, a “mega-pod”, were swimming together, blowing off vapor, and diving in rough synchronization. 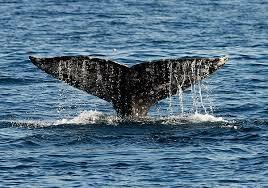 As we approached, we could see the backs of the whales, scarred by barnacles, but glistening silver-gray in the sun. 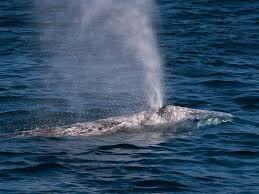 The whales exhaled, one after another, or two at a time, sending fountains of white spray into the clear air. Then they dived, one by one slithering their huge bulk in an arc as they bent toward the bottom of the sea, than at the end flipping their heart-shaped flukes up into the air as if waving farewell. It was like a dance. We waited and watched – where would they come up next? A shout – “6 o’clock! Behind us” and the performance was repeated. “”10 o’clock! On our left!” and again the aquatic dance. Why was this group of whales gathered together? The on-board naturalist had no clue. “It’s not usual to find so many in one group.” We watched and wondered. Finally the boat went on – there was more to see. “There’s a big school of dolphins up ahead – maybe they’ll come to play with the boat.” In a moment we were surrounded by hundreds of hurtling gray shapes – needle-nosed dolphins barreling through the water next to the boat, dodging in and out of the bow wave, surfing in the wake, racing alongside the boat in huge leaps which sent them flying out of the water. “If the water were rougher they’d ignore us,” said the guide, “but when it’s calm like today they get bored, and the boat is like a big toy to them.” Could this be true? Or was he just ascribing human-like motives to these gray bullets? Why were there hundreds of dolphins in this one small space of ocean? He had no clue. As we headed back toward the bay, the boat detoured to observe some Rossi’s dolphins, a very different sort. 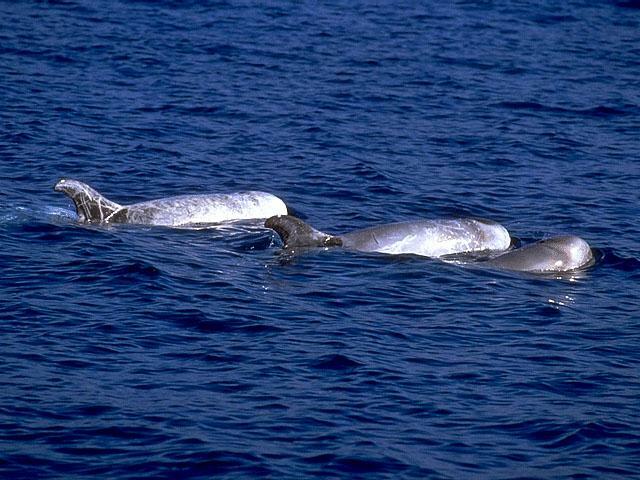 These are stately silver swimmers, with a vertical dorsal fin and a rounded bullet head. The Rossi’s dolphins don’t leap from the water, don’t race each other, but swim smoothly along at a steady pace, paying no attention to our boat. “They mind their own business and want us to keep our distance,” said the naturalist. But what is their business? And why are they so unafraid, yet so aloof? I read with bemusement about our astronomers’ search for alien life on other planets. Most marine scientists seem to believe that dolphins and whales have enough brain tissue to have evolved what we would call reasoning, and that they communicate with each other through complex sonar systems. How can we hope to recognize and interact with intelligent aliens on other planets when we understand so little about the intelligent aliens on our own?